Wow, say that five times fast! 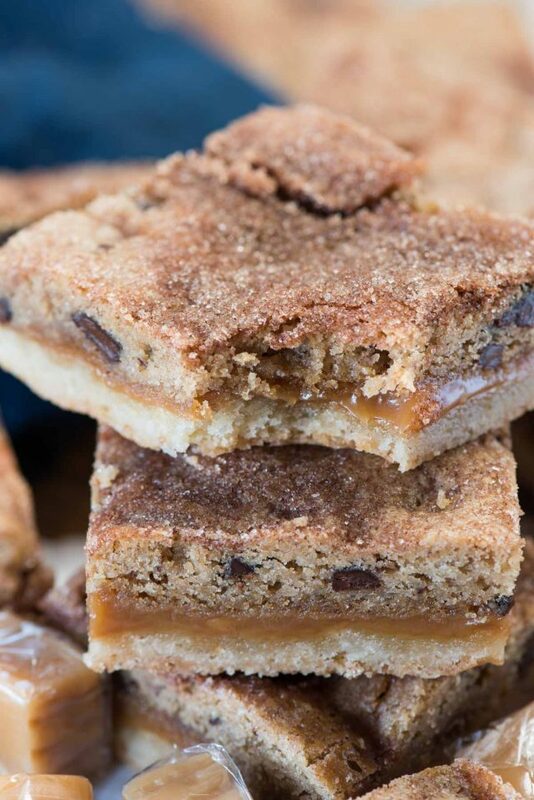 Snickerdoodle Chocolate Chip Caramel Bars have a snickerdoodle crust, a gooey caramel center, and a chocolate chip cookie top. This easy cookie bar recipe is the ultimate indulgent dessert! Real quick before we talk about how amazingly good and gooey these cookie bars are: who watches the RHONJ? I just watched the first part of the reunion (haven’t watched part 2 yet) but OMG. I am ready to jump through my screen at Siggy. I’m totally #TeamMargaret on this one; Siggy can’t take a joke, she can’t handle not being perfect and right. I almost had to stop watching the reunion because I couldn’t handle her…and then Andy announced Kim D. was arriving and I was all let’s grab the popcorn. Okay, back to these cookie bars. Are you looking for something deliciously gooey and amazing to bake? Whether you make this for a party or because it’s Thursday, this easy bar cookie recipe is heaven-sent. They’re not just a snickerdoodle bar, nope. And they’re not just a chocolate chip cookie bar either; no these bars are a combination of those PLUS gooey caramel. Layer 1: Snickerdoodle cookies, pressed into a crust. Layer 2: a GOOEY caramel center. Layer 3: Chocolate Chip Cookies, dropped all over the top. And the final nail on the fat-pants coffin? Cinnamon sugar sprinkles all over the top, reminiscent of a snickerdoodle cookie. 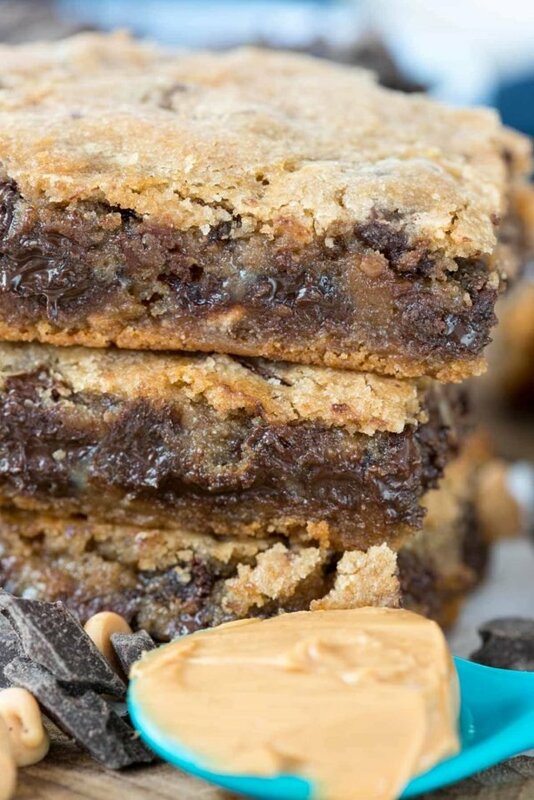 This cookie bar recipe is going to be your new favorite go-to dessert, I promise. 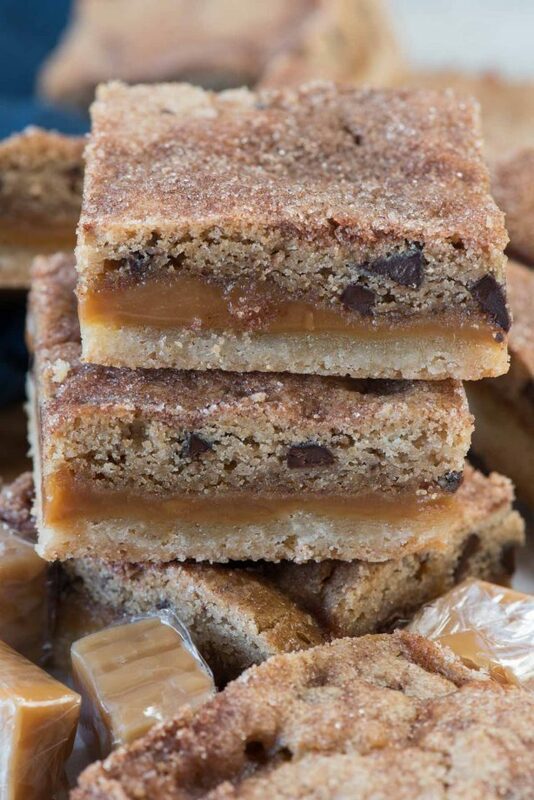 Snickerdoodle Chocolate Chip Caramel Cookie Bars have three layers of indulgent cookies and caramel! Sometimes when I see recipes like this, with three layers, my head explodes because I know that means lots of dirty dishes as I make two different cookie recipes. BUT! This recipe isn’t like that. Two bowls max – and easy peasy measuring because you start with two different Krusteaz cookie mixes. 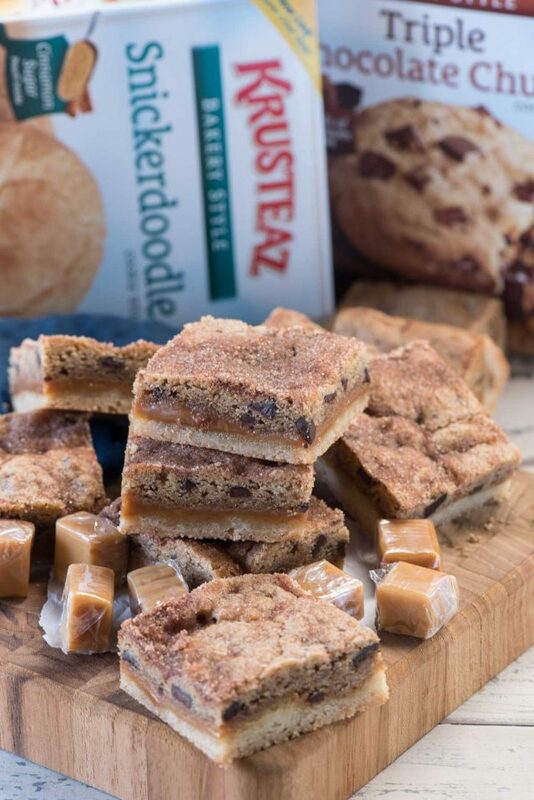 I absolutely love the Krusteaz mixes, and make lots of different recipes using them. The cookie mixes are my absolute favorite and they do not taste like you would perceive what a “box mix” would taste like. They taste homemade, I promise. Mix up the snickerdoodle cookies as directed. I like using my stand mixer, but a hand mixer or wooden spoon works too. Press those into a pan, and pre-bake them for a few minutes. In a second bowl, melt together the caramel ingredients. Pour over hot snickerdoodle crust. Mix up the chocolate chip cookies in the same bowl as the snickerdoodles – easy, right? Then drop over the top of the caramel. Sprinkle with the cinnamon sugar that came with the snickerdoodle mix, then bake and eat. Good luck waiting for these to be cool before eating! Seriously though, these bars are pure heaven. Enjoy! This recipe first appeared on the Krusteaz website, where I am an ambassador. Snickerdoodle Chocolate Chip Caramel Bars have a snickerdoodle crust, a gooey caramel center, and a chocolate chip cookie top. 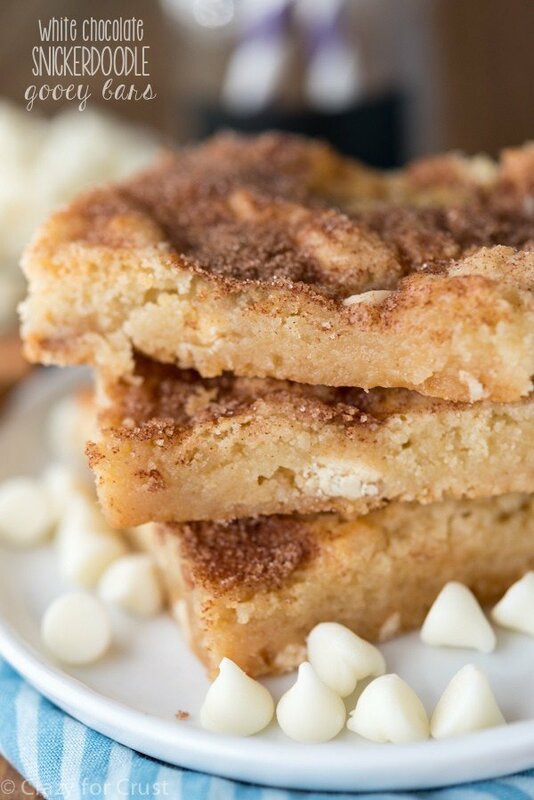 This easy cookie bar recipe is the ultimate indulgent dessert! This recipe has been sponsored by Krusteaz. All opinions are 100% my own. That caramel layer! No words. That is heaven right there! Don’t worry about Siggy for too much longer. She is not going to be back for next season (thank God.) Maybe Michael finally got to her and made her stay at home. I can’t believe she is making all of these “inspirational” speeches and she doesn’t even have a degree. I wouldn’t pay to listen to her. I’m in total agreement–she is way too over-the-top in her accusations. hey girl- these bars look amazing! yum-o! Wow! All my favorite flavors in one bar! Yummy, I can’t wait to try!